Go ahead. Look at my flowers. They’re such big flowers. You know you want to look. OK, forgive me for my cheeky-ness. It’s early. It’s Friday. I just calculated the velocity to lift equation, the result is I’d never get my bulk off the ground. or is it “elven”? or “elvin”? #2 Janet’s friends gifted her with the X-rated version of the Leggy poster, but being the shy unassuming virgin that she is the parts in question were always strategically covered from her eyes, those passing by in the hall however got a great view! 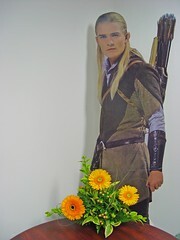 Caption: Legolas hides The Precious behind some strategically placed flowers. Your picture story is very spooky! 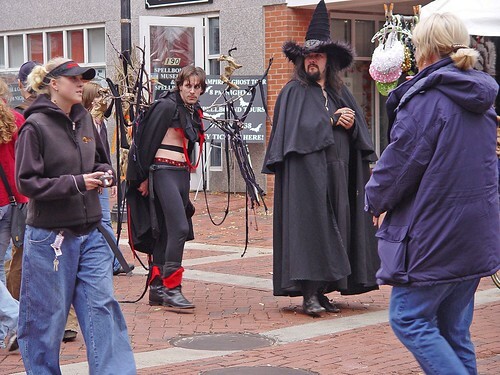 I’d freak out if I saw any of them walking down the street toward me – Halloween or not… and your angel is lovely. My caption: Strong enough for a man, but made for a woman! Hmmm, true, a weird Halloween. Caption: Will the flowers work to get Maid Marion, or should I use an arrow? That really is a scary first pic! That due looks seriously demented! That other dude looks like the late guitarist of Pantera! Hey I think I know that guy in the big hat. Well, not KNOW know but, worked in the same rennaisance faire? Maybe? Cool pic of Salem. Weird place normally, but even more so @ Halloween! 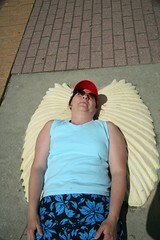 My Caption: Once Lord of the Rings wrapped, Legolas auditions for the FTD Mercury position.